This popular set from Crazy Devy includes everything you need to soup up your Devastator! 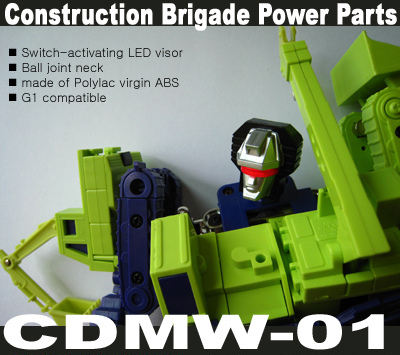 Included is a more accurate G1 head, that attaches to your devastator and lights up. This is a custom piece from 3rd party maker Crazy Devy, it is not an official Hasbro or Takara/Tomy piece. However the look, feel and quality is very high, and really brings new life to a G1 Devastator.